With more than 5,000 killed in its revolution and ensuing civil war, you may have thought Ukraine has had its fill of violence. Apparently not, judging by the latest evidence from the country’s parliament building. Footage, see above, has emerged of two MPs involved in a vicious fist fight earlier today (Thursday, February 12), which left one with a bloody nose. 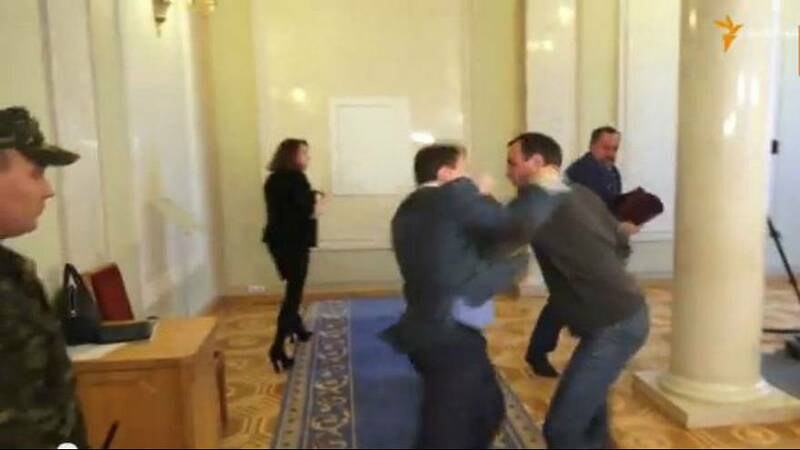 The altercation was over a corruption bill, according to Radio Free Europe/Radio Liberty (RFE/RL), which captured the violence. The MPs involved were Yegor Sobolev, of the centre-right Samopomochi party, and Vadim Ivchenko, from the Fatherland party, also centre-right, according to Reuters.